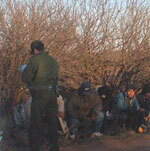 31 May 2007: Illegal Immigration has become one of the United States’ most difficult social and economic problems. More than 12 million ‘undocumented immigrants’  mostly from Mexico  are now estimated to be in the US. American cities have been dealing with this reality for years. The number of illegal immigrants entering the US expanded dramatically after implementation of the North American Free Trade Agreement in 1994. The Agreement eliminated many of the tariffs, duties, and other trade barriers between the US, Mexico, and Canada. The Agreement also dislocated millions of Mexican farmers and industrial workers who moved north to the US for employment opportunities. At the same time, American workers were feeling less secure about their jobs. Tensions began to rise between many Americans and migrant workers, and illegal immigration began to receive heightened scrutiny from the media and lawmakers in the US. The Bush administration and the US Congress are currently debating a comprehensive immigration bill. While it’s unclear what compromises may be reached, there seems to be a broad consensus that mass deportation of illegal immigrants is both unfeasible and inhumane. Most federal lawmakers also seem to feel that most undocumented residents, particularly those who have lived in the US for many years, should be given a chance at some form of legalization. In other words, there is a tacit acknowledgement among federal lawmakers that illegal immigrants are part of the American social and economic fabric. American cities have been dealing with this reality for years. In May 2007, Detroit became the latest US “sanctuary city.” Sanctuary cities pass ordinances which ban the profiling of people based on race, ethnicity, dress or appearance, and immigration status. Police in sanctuary cities are effectively prohibited from asking about immigration status without criminal cause. Detroit joined at least 30 other American cities with similar legislation, including Los Angeles, San Francisco, Baltimore, New York, Houston, Seattle, and Washington, DC. Sanctuary cities defy federal guidelines established after the 9/11 attacks. These guidelines call on local law enforcement agencies to help enforce immigration laws, ostensibly to prevent the entry and movement of terrorists. In April 2007, when federal authorities raided a company in the San Francisco area suspected of employing illegal immigrants and arrested 13 foreign nationals, San Francisco Mayor Gavin Newsome condemned the raids. In July 2007, New Haven, Connecticut will begin issuing “locally legal” identification cards to undocumented immigrants. These ID cards will make it easier for undocumented immigrants to apply for bank accounts, sign rental leases, receive health care in hospitals, apply for jobs, and interact with police without fear of arrest. At least 20 other US cities are considering similar programs, including Hightstown, New Jersey. While scores of US cities have extended protection to illegal immigrants in defiance of federal law, other cities are making it more difficult for illegal immigrants to be part of mainstream society. Many cities have passed legislation that is stricter than federal law. The most well-know example is Hazelton, Pennsylvania’s Illegal Immigration Relief Act. Passed in 2006, the legislation denies licenses to businesses that employ illegal immigrants, fines landlords for renting to illegal immigrants, and requires that all city documents be written in English only. More than 90 US cities have similar anti-illegal immigrant ordinances. Since these ordinances are more punitive than federal statutes, they are regularly challenged in the courts by civil rights groups, residents, property owners, and businesses. Cities with anti-illegal immigrant ordinances often spend hundreds of thousands of dollars defending themselves against such legal actions. Other cities  perhaps hundreds  have joined or are considering a federal initiative which allows local police departments to determine whether illegal immigrants are eligible for deportation proceedings. In other words, local police officers act as federal immigration cops, the exact opposite of what is happening in sanctuary cities. The different ways that cities cope with illegal immigration reflects the deep divisions in American society on the issue. Pending federal legislation is unlikely to quell the debate. The proposed comprehensive federal immigration law contains enough compromises to keep everyone dissatisfied. A US federal judge has struck down several anti-immigrant ordinances passed by the city of Hazleton, Pennsylvania. This "Illegal Immigration Relief Act" imposed strict penalties on landlords and employers if they rented to or hired illegal immigrants. Hazleton mayor Lou Barletta said his city would not back down. US District Court Judge James Munley has ruled that it is unconstitutional for the city of Hazleton to impose fines on businesses that hire illegal immigrants and landlords who rent to them. Hazleton passed the "Illegal Immigration Relief Act" last July but never implemented it because of a court injunction. However, the court ruled that a city cannot enact any ordinances dealing with illegal immigration because they conflict with what is commonly called the supremacy clause of the US Constitution, which makes federal law the supreme law of the land.